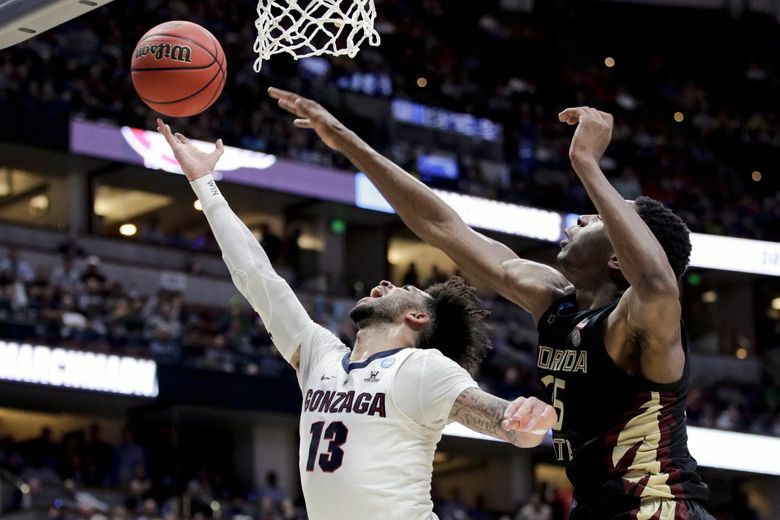 ANAHEIM, Calif. — Gonzaga pretty much did to Florida State on Thursday what the Seminoles did to the Zags last year in the NCAA tournament. 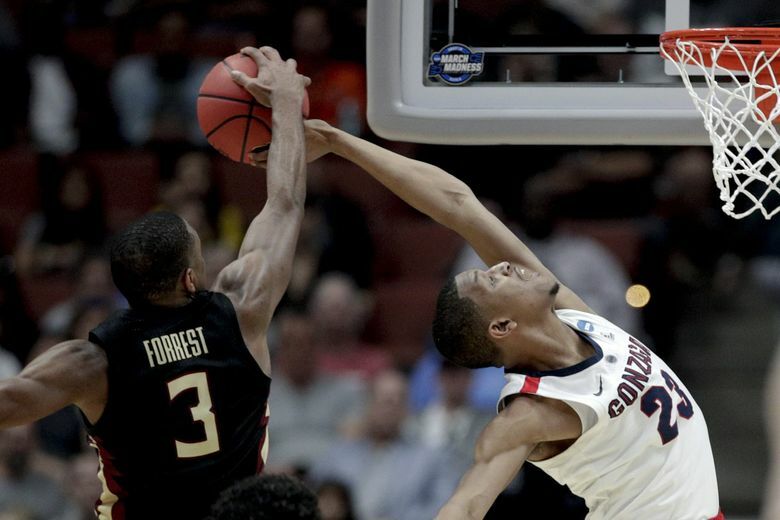 The Zags won the physical battle — no easy task against a tall, bruise-inflicting opponent. 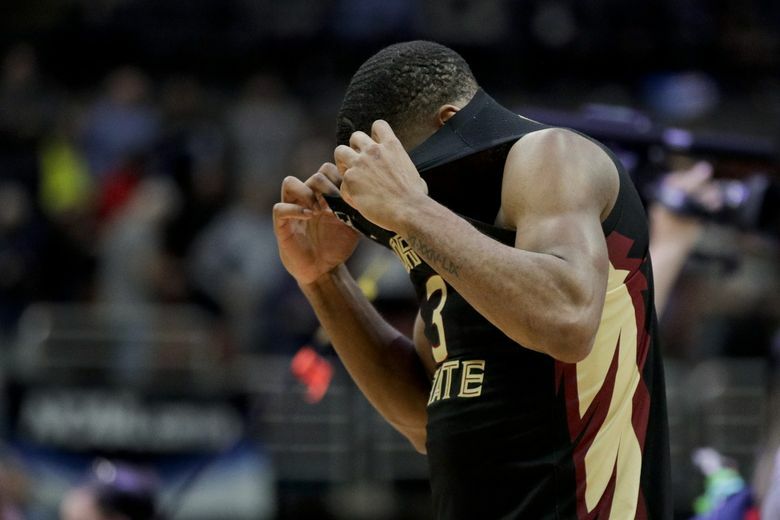 Their defense stifled FSU’s primary weapons and they were resourceful offensively with Brandon Clarke and Zach Norvell Jr. delivering clutch points in a nervy closing stretch. 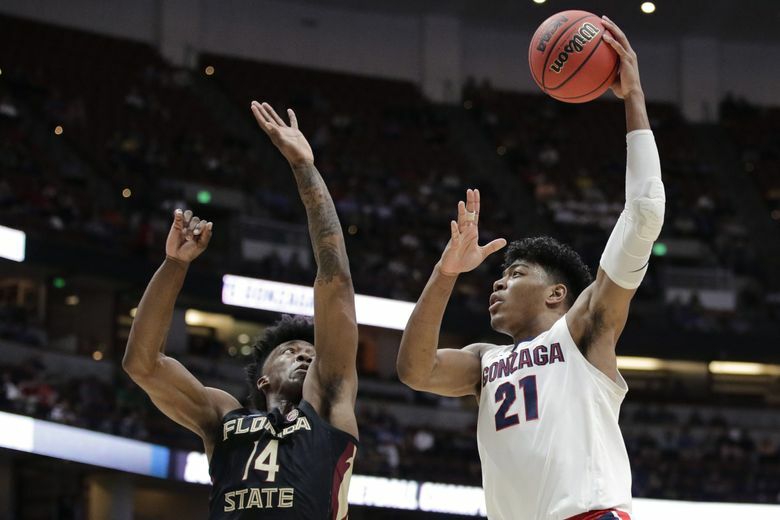 Top-seeded Gonzaga handled the fourth-seeded Seminoles 72-58 at the Honda Center, essentially making the turnaround complete with a score similar to FSU’s 75-60 victory last season. 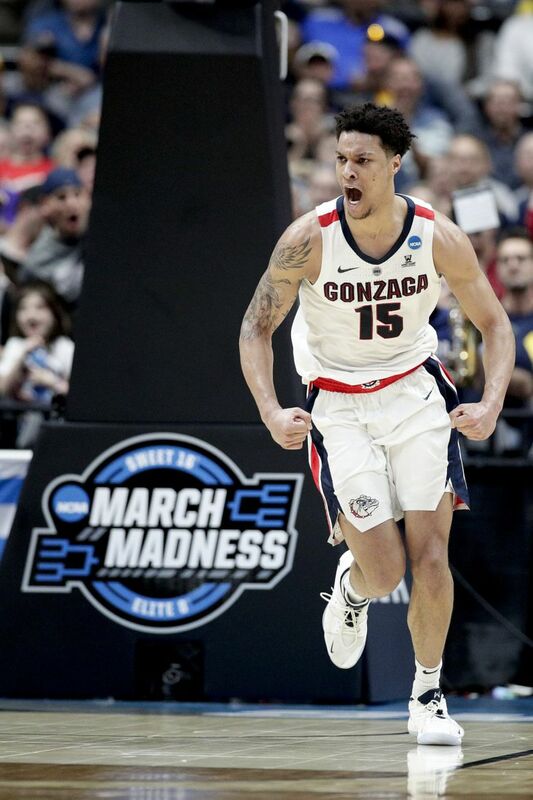 Gonzaga (33-3) moved into the Elite Eight for the third time in five years. The Zags will face No. 3 Texas Tech at 3:09 p.m. Saturday. They got there with defense and determination down the stretch, somewhat new wrinkles from the season-long script of record-setting offense and blowout victories. For most of the game, actually. The Seminoles (29-8) had one reliable weapon, guard Trent Forrest and his slick drives and finishes. The rest of the Seminoles made just 16-of-50 shooting (32 percent). 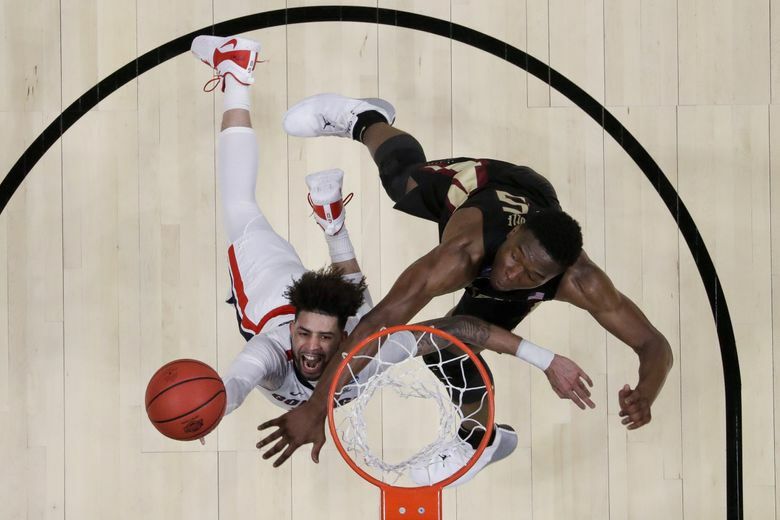 Still, FSU applied the heat, oddly with a surge that followed three Gonzaga possessions capped by dunks. The Seminoles cut the deficit to 60-56, a tense situation Gonzaga made more uncomfortable by missing the front end of two 1-and-1s. 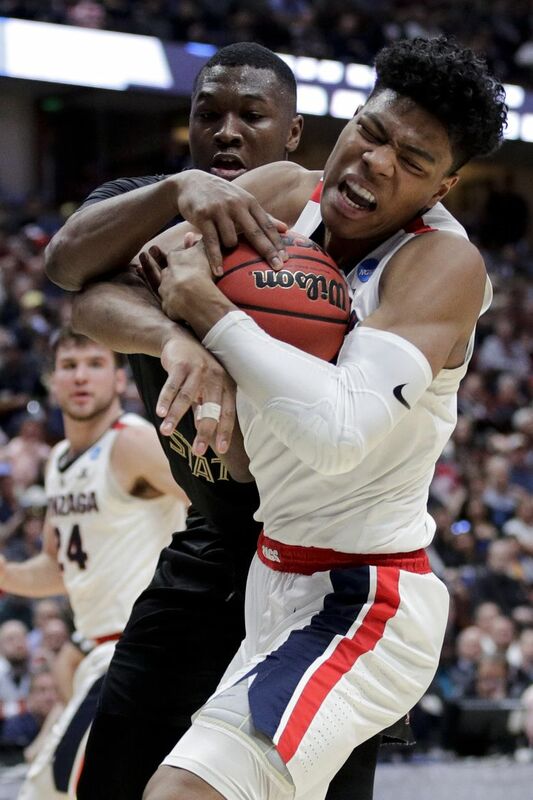 The Zags fed Rui Hachimura, who drew two defenders and kicked a pass out to Zach Norvell Jr., the sophomore wing who has a knack for canning clutch shots. Norvell’s three with 3:06 left gave Gonzaga a 63-56 lead. Clarke, who guarded Forrest down the stretch and kept the Seminoles’ guard in check, hit a pair of free throws and added a layup to extend Gonzaga’s lead to 67-58 with 1:15 remaining. Clarke produced 15 points — seven to help nurse the Zags’ offense out of a second-half lull — 12 rebounds and five blocks. It wasn’t a masterpiece, but there was little chance of that against the Seminoles, who rank 10th in KenPom’s adjusted defensive efficiency. 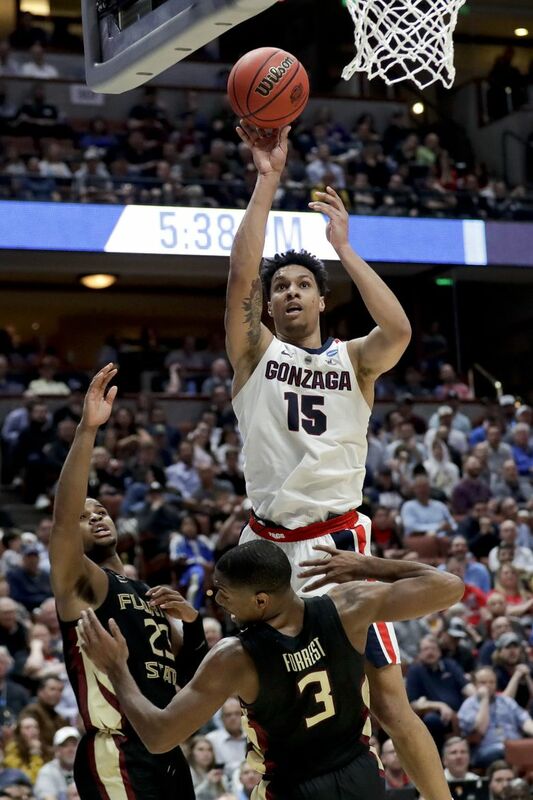 The Zags stuck with it and found the balance that has made them difficult to defend all season. They scored 30 points in the paint behind Clarke and Hachimura, who finished with 17 points, and 21 points from beyond the three-point line. Gonzaga struggled mightily in both areas in last year’s meeting. The Zags made a ton of plays on the defensive end. Forrest, who averages 9 points, scored 20, but leading scorer Mfiondu Kabengele (13.4) managed just eight points. Terance Mann, who scored 18 against the Zags last year, made one field goal and had five points. Gonzaga’s defense took control in the first half. FSU managed just 10 field goals while committing nine turnovers. Hachimura and Perkins both had 10 points in the opening half. Perkins’ steal and three-point play near the end of the half gave Gonzaga 38-27 advantage. Perkins enjoyed the play a little too much. Perkins and FSU’s M.J. Walker exchanged words and both were whistled for technical fouls. Perkins thoroughly enjoyed Gonzaga’s defensive effort. FSU was 3 of 20 on 3-pointers and only attempted 11 free throws. The Seminoles’ size advantage didn’t translate to the boards. Gonzaga won the glass 45-36 and had a 17-4 edge in second-chance points. Where: Honda Center; Anaheim, Calif.